January 14, 2015 13:24 ET | Source: Greenland Resources Inc. FIGURE 1. 3D view of the orebody in red with the proposed Phase 1 drill hole locations in green. 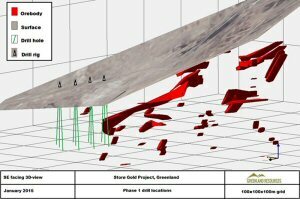 Greenland Resources Inc. ("Greenland Resources" or the "Company") is pleased to provide an update on its activities at the Storø Gold Project (the "Project") in Greenland. The Project is located in the Nuuk Fjord area of southwest Greenland, some 40 km northeast of the capital city of Nuuk. The Company is planning a two-phase exploration program consisting of 4,000 metres core drilling which includes drilling the downward extension of the NE plunging Main Zone mineralization as well as infill drilling in the Main Zone area. The Company expects this program to be completed in the second half of 2015. During the month of October, 2014 the Company made a reconnaissance site visit to Storø to outline appropriate locations for drill setups in winter conditions. In addition, the company prepared an in-house 3D model of the ore body and a financial model to assess the cost of a small scale open pit mine as a preliminary step towards a PEA. In November, 2014 the Company commissioned the Canadian company RPA Inc, one of the leading mining consulting groups worldwide, to provide assistance in the drilling program, and prepare a Mineral Resource estimate in the context of a Preliminary Economic Assessment. During the month of December, 2014 and consistent with the recommendations of the Company's NI 43-101 dated July 30, 2014, Greenland Resources resampled 215 samples constituting 5.5% of the already sampled intervals of 10,758 metres of historical core. These samples along with inserted Certified Reference Materials (standards), field blanks and field duplicates were shipped for chemical analysis to ALS Scandinavia in Sweden, results are expected by mid-February, 2015. In addition to the resampling, 1,096 photos were taken of the historical core. Due to the coarse character of the gold grains and consequent nugget effect, ALS Scandinavia in Sweden will determine the gold values by 1 kg screen fire assay (50g nominal sample weight). The sample pulp (1 kg) is passed through a 100 micron stainless steel screen. Any material remaining on the screen (>100 micron) is retained and analyzed in its entirety by fire assay with gravimetric finish and reported as the Au (+) fraction. The material passing through the screen (<100 micron) is homogenized and two sub-samples are analyzed by fire assay with AAS finish. The average of the two AAS results is taken and reported as the Au (-) fraction result. The gold values for both the (+) 100 and (-) 100 micron fractions are reported together with the weight of each fraction as well as the calculated total gold content of the sample. Blanks, duplicates and certified reference standards are routinely inserted into the sample stream to monitor laboratory performance. The Company is continuously reviewing new asset opportunities to increase shareholders value. The Company considered several different scenarios based on quotes from contractors in Canada and Europe in order to diligently reduce the overall cost of the drilling program. Based on weather conditions, cost and time optimization, Phase I drilling is slated to commence early March, 2015 and will test the down-plunge extension of the Storø Main Zone gold mineralization. The 3D modelling performed by the Company on results from the extensive historical drilling, has defined a roughly northeast trending mineralized structure measuring approximately 50 metres by 450 metres situated within the hinge zone of an anticlinal fold below the northeast dipping slopes of the Qingaaq Mountain. As shown in Figure 1, a set of 40m step-outs with a minimum of 3 intersects in each step-out drilled in a plane perpendicular to the orientation of the mineralized zone will be drilled in Phase I. The Company has contracted Cartwright Drilling Inc, Canada for the diamond drilling on Storø and has sourced the logistical counterparts for the execution of the winter program. Greenland Resources will continue using ALS Scandinavia in Sweden to analyze the samples resulting from the drill program. The Company is currently sourcing consultants for an Environmental Impact Assessment including an environmental baseline study that will constitute an important element of the future application for an exploitation permit. Phase II drilling will target infill of the main zone and will commence in the Q2- 2015. To view FIGURE 1, please visit the following link: http://www.marketwire.com/library/20150114-Figure1Greenland.jpg. The Storø exploration licence is held by Copenhagen Minerals Inc., a wholly owned subsidiary of Greenland Resources Inc. and comprises a total area of 66 km2. Since 1995, a total of 86 drill holes totaling 15,375 metres have been drilled by previous owners. The Storø Gold Project is located nearby the publicly traded companies Hudson Resources, London Mining, True North Gems and North American Nickel. The gold prospects in the Nuuk Fjord area are located in the strongly deformed and metamorphosed rocks of Archean age. The area is an extension of the North American Craton and is suggested to correlate with the Nain Region in Labrador, Canada. At the Storø Gold Project there are two levels of mineralization, the Main Zone and the BD Zone. Both zones are situated within the Qingaaq Mountain and are up to 12m thick with 10-50m wide low grade alteration halos. The main focus of Greenland Resources's exploration is the Qingaaq Mountain area in the southwest of the licence. The Main Zone occurs in an antiformal fold in the upper amphibolite unit and consists of auriferous quartz veins in garnet and biotite alteration zones up to 50m thick. Surface rock grab samples have returned up to 82.3 g/t Au (Sample RGC106916) in this area with common visible gold in both surface and drill core samples. The Main Zone has been traced to 150 m below the surface in drill holes and gold grades in drill samples range up to 52g/t Au over 2m (DDH05-05 47m-49m). The BD Zone occurs lower, on the contact between biotite-sillimanite-garnet gneiss and the upper amphibolites and gold occurs mainly in quartz-veined, arsenopyrite-bearing zones along the contact and in both rock types up to 20m away from the contact. Gold grades in drill core samples range up to 15 g/t Au over 10m (DDH 10-54 39m-49m). The BD zone has been followed along strike for 700-800 m with channel samples that returned up to 22g/t Au over a true width of 1.8m (Sample RCH213061). The mineralization has been traced to nearby Aappalaartoq Mountain situated 4 km to the NE from Qingaaq Mountain. On Aappalaartoq surface samples return up to 25.6 g/t Au (RGB212942) in situ and 46.4 g/t in scree (SCS111358). Selected intercepts of the auriferous zones below Qingaaq Mountain comprise but are not limited to: 20m of 6.3g/t Au (DH95-03); 12m of 4.2g/t Au (DH05-01); 23.9m of 6.4g/t Au (DH05-05); 12.1m of 5.6g/t Au (DH06-32); 28.8M of 6.74g/t Au (DH10-54). True width is likely to be less than the apparent intercept depending on the orientation of the mineralized structures. Au grade = weighted average (total length*total grade/total length). The scientific and technical information contained in this press release has been reviewed by Jim Steel, MBA P.Geo., who is a "Qualified Person" as such term is defined under National Instrument 43-101 - Standards of Disclosure for Mineral Projects ("NI 43-101"). Greenland Resources is a Canadian public company regulated by the Ontario Securities Commission, focused on the acquisition, exploration and development of properties for the mining of gold and other minerals in Greenland. The main exploration project is the Storø Gold Project, a high grade gold deposit owned 100% by Greenland Resources. With offices in Toronto and in Copenhagen, Greenland Resources is led by a management team with extensive track record in the mining industry and capital markets. For further details, please refer to our web site (www.greenlandresources.ca) as well as our Canadian regulatory filings on SEDAR at www.sedar.com. CAUTIONARY STATEMENT: No stock exchange, securities commission or other regulatory authority has approved or disapproved the information contained herein. This news release contains forward-looking information, which is not comprised of historical facts. Forward-looking information involves risks, uncertainties and other factors that could cause actual events, results, performance, prospects and opportunities to differ materially from those expressed or implied by such forward-looking information. Forward looking information in this news release includes, but is not limited to, the Company's objectives, goals or future plans, statements regarding the estimation of mineral resources, exploration results, potential mineralization, exploration and mine development plans, the availability of financing, the timing of the commencement of operations and estimates of market conditions. Factors that could cause actual results to differ materially from such forward-looking information include, but are not limited to, failure to convert estimated mineral resources to reserves, capital and operating costs varying significantly from estimates including the costs of operations in remote mountainous environments, the preliminary nature of metallurgical test results, delays in obtaining or failures to obtain required governmental, environmental or other project approvals, political risks, uncertainties relating to the availability and costs of financing needed in the future, changes in equity markets, inflation, changes in exchange rates, fluctuations in commodity prices, delays in the development of projects and the other risks involved in the mineral exploration and development industry. Although the Company believes that the assumptions and factors used in preparing the forward-looking information in this news release are reasonable, undue reliance should not be placed on such information, which only applies as of the date of this news release, and no assurance can be given that such events will occur in the disclosed time frames or at all. The Company disclaims any intention or obligation to update or revise any forward-looking information, whether as a result of new information, future events or otherwise, other than as required by law.